Here’s a brief recap on what’s coming up in the November 11th update. The update will release with the [Arks Grand Prix 2016 Preliminaries], a new limited-time Challenge Quest that pits players against Kuronite and Toy Darker enemies. The quest will allow players to choose a [Class Setup] that focuses on different attack styles like striking, ranged, tech, etc. This quest will take place in Shironia, and is only available from the Challenge Blocks. Players can even earn Challenge Miles from playing the quest. The Arks Ship Fire Swirl will be returning as a pre-scheduled Emergency Quest. Players can receive [Weapons Badges] as a reward for clearing the quest. Furthermore, on Extra Hard difficulty, they can even earn [Lambda Grinders] from Emergency Trials. Most of the scratch contents will cover costumes and hairstyles from 7th Dragon III code: VFD. 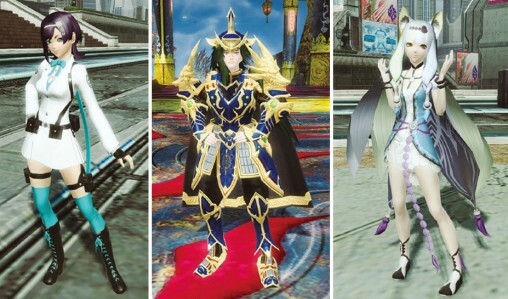 In addition, costumes from the Taiwanese version of PSO2 will finally make their Japanese debut. Well that is a fail right there for the Ranger type. Gunner can’t sub worth a crap compared to Hunter or Braver. Can’t sub worth a crap compared to anything. It says Ranger x Gunner tho, not Ranger/Gunner. Maybe it’s like Challenger class but you only get Ranger and Gunner’s skill discs and PA discs. Do you not understand what I mean or are you saying that Gu/Ra is bad? Since cmode has only challenger class, its likely so. Its just that people want their old comfy RaHu and RaBr instead of something sought to be removed for more than a year. Actually, in Dengeki scans it shows you a palette, where you can pick any 50ele +10 weapon related to the combo. You also start at lvl75. Is cape a separate accessory or part of the costume? What’s the source for this information? A magazine? Usual places don’t seem to have anything.